After seeing a dozen or so Shah Rukh Khan's movies, I was really hooked and decided to search for more of his earlier movies as well as check out new releases. This post is not in chronological order. 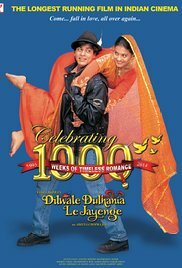 An early big breakthrough came with Kajol in "Dilwale Dulhania Le Jayenge" (1995). This time he played an NRI (Non Resident Indian) based in London looking for a wild trip with his friends to Switzerland. Kajol played a relatively innocent girl with a very strict father using persuasion to go with some girl friends to Switzerland. Of course they meet, go through a few misunderstandings and feel they are meant for each other. Her father does not approve and takes her off to India for an arranged marriage, but our hero pursues. Anupam Kher played a supportive father. Aditya Chopra directed This is considered one of the most romantic movies of all time and is now the longest running film in the world, engendering a lot of references in other movies. Shot in England, Switzerland and India. Bollywood was fond of foreign scenes and this movie helped boost Swiss tourism. Before that breakthrough Shah Rukh Khan made a decision that could have killed his career. For 1993 he decided to take on a negative role, in fact in three movies--"Darr," "Baaziger" and "Anjaam" where he was not only mean, but psychotic. He earned acting awards and became a hit with the public. "Pardes" (1997) filmed in Las Vegas and British Columbia. Another angle on the NRI. A rich man in America wants his son to have a real Indian wife. Shah Rukh plays the adoptive son who tries to mediate the marriage, but his efforts result in a lot of chaos as the son is very spoiled and the adopted brother is very conflicted. One complaint from this film (and many other Bollywood efforts) is the fighting--the action seems real enough, but they add in extra sound that makes it less realistic. Of course Shah Rukh Khan's virtues result in a happy ending. "Chalte Chalte" (2007) was a different kind of romance. Shah Rukh Khan playing a truck owner/driver meets sophisticated Rani Mukerji and after a fairly short romance gets married. Class conflicts are fairly normal, but they carry on with verbal fighting through to the end of the movie. You could say the bickering made it more realistic. Filmed in Greece. "Hey Ram" (2000) was directed and written by Kamal Hassan who also played the lead who married Rani Mukerji. Shah Rukh had a relatively small role. This movie climaxes with the assassination of Gandhi. "Dil Se" (1998) was directed by Mani Ratnam and was considered a major success on several fronts including Shah Rukh's acting. He played a man infatuated with a woman, Manisha Kairola who is bent on a suicide bombing mission. At one point Shah Rukh's character has a marriage of convenience which happens with Preity Zinta in her debut movie. The music by A. R. Rahman was considered very good with one song, "Chaiyyan Chaiyyan" being used in a Hollywood movie by Spike Lee, "The Inside Man." The choreography by Farah Khan was considered exceptional including a sequence on a moving train. "My Name is Khan" (2010) represented an acting challenge for Shah Rukh. In it he plays a man with Aspberger's syndrome. He is a Muslim who surprisingly marries a non Muslim, Kajol and after an unfortunate incident needs to prove he is not a terrorist. He travels across the United States and has many interesting adventures. Some memorable music from Shankar Ehsaan Loy. "Ra-One" (2011) was a science fiction action film intended by Shah Rukh to demonstrate Bollywood technological skills and in fact did win awards for special effects. He plays a dual role, a mild mannered engineer and a dynamic video character. Most noted for an infectious dance song, "Chamak Chalo" performed by American rapper Akon and written by Vishal-Shekhar. Also starred Kareena Kapoor. He broke his vow not to lip lock (kiss on the mouth) with Katrina Kaif in last film directed by Yash Chopra and written by Aditya Chopra "Jab Tak Hai Jaan" (2012). He plays a man abandoned by a woman who loves him, due to a religious vow and then Shah Rukh becomes a bomb disposal expert. Also starred Anushka Sharma as an annoying reporter. Music by A R Rahman. Filmed in Kashmir and London. "Chennai Express" (2013) saw him reunited with Deepika Padukone in an action romance comedy. At the time it was the highest grossing Bollywood film to date. 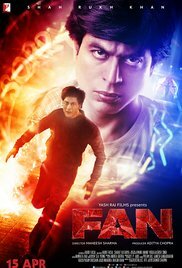 In"Fan" (2016) he had a dual role with the aid of CGI and prosthetics where he plays the mature star and an obsessive young fan. A well done movie. It shows how a movie star (like Shah Rukh himself) can become arrogant and detached from his fans. It also illustrates how obsessive a fan can become. Filmed in England, India and Croatia. Next film is "Raes" and he plays a bad guy. Animated version of "Kuch Kuch Hota Hai" to come out as "Kuchie Kuchie Hota Hai"
The three stars atop Bollywood are all Muslim: Salman Khan, Shah Rukh Khan and Aamir Khan, but all in their late 40's and mostly romancing much younger women. In real life he was born and raised in New Delhi and did very well in school including sports. He fancied a Hindu girl, but found her parents didn't like the idea of inter-religious dating. Eventually he won them over. Shah Rukh and Gauri, now have three children with the youngest being born through a surrogate. Gauri is often a producer with his films. His son has done some minor appearances in movies and dubbed for a Disney animated film. One of his strongest interests is in a cricket club he owns, Kolkata Knight Riders who compete at a high level. On stage he is considered spontaneously humorous and has been asked to host game and award shows. He has hosted many dinner/parties for other celebrities. Recently Tim Cook, the CEO of Apple and then cast and crew of an Iranian-Indian film, "Salaam Mumbai." Concern for making it in the English speaking world--speaks some English in most of his movies. He has also advocated for improving technical production values. He smokes in many of his movies (not in" Fan") and is supposedly trying to cut down. His following is massive--over Asia, Europe, Africa and North America and it is not all from the Indian diaspora. At his best Shah Rukh Khan is why I love Bollywood, although I have grown to appreciate many other actors and films. I will be looking for more of his old films and anticipate new ones.